Human Hepatic Duct Fibroblasts (HHDF) are unique cell type that play an important role in liver homeostasis and maintenance. Primary culture of Hepatic Duct Fibroblasts is suitable for many cell-based assays including toxicity, drug screening and metabolism and is a valuable tool to study liver function, physiology and related liver diseases. 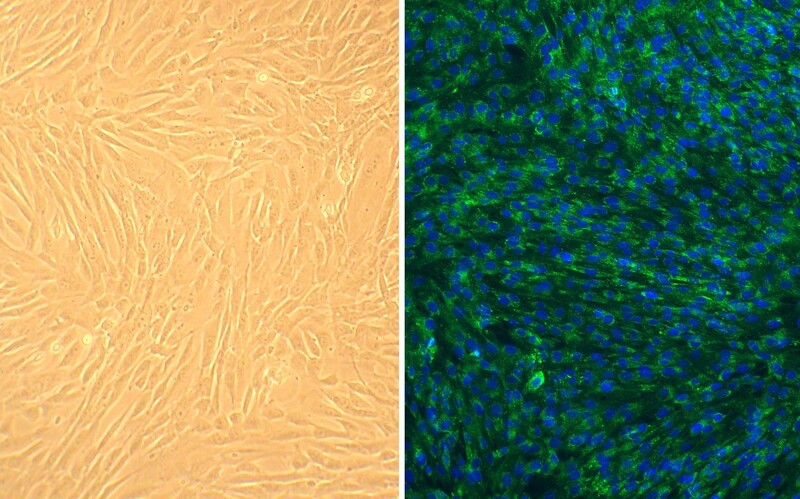 Human Hepatic Duct Fibroblasts: HHDF, Left: phase contrast, Right: HHDF immunostained for fibroblast surface protein (green) and nuclei are stained with DAPI.